The Naïf Art Festiwal in which Paulina Constancia’s art is featured alongside the works of other naif artists from around the world will come to a close on August 18th. If anyone of you happens to be in Poland, this is the Festiwal’s last week so please do check out this incredible exhibition. Here are Paulina’s works that are featured in the festival. Here are the works of Paulina Constancia featured in the 10th Art Naif Festiwal in Poland. Special thanks to the organizers and supporters of the festival especially to the Director Monika Paca and Katarzyna “Kasia” Kraus for all the love and hard work they put into realizing this wonderful event. Click here to view photos from festival. Gabii sa Kabilin~GSK (Heritage Night) is happening on Friday, May 26th. We are happy to inform you that we have prepared a very exciting program for this year’s GSK. The circle “alidong” (Ceb.) -a simple closed shape with unlimited possibilities is the focus of this year’s GSK celebration at the MoNA. Highlighted this year are the concentric works in the museum collection. Workshops and other activities lined up give the GSK goers a chance to explore the world of circles, dots and rangoli. This year MONA also has a special featured artist- Indian naïve artist Yasha Dabas who will share rangoli and Indian arts with us. We also have another happy news for GSK goers . This year our sister permaculture-inspired lodging establishments will be officially opening their in-house museums. The Mayflower Inn (A Heritage and Permaculture Inspired Hotel ) will be opening the Museum of Heritage and Folk Art (MoHFA). It seeks to promote our diverse cultures and shared humanity. The Elicon House (An Ecological Living Conservation House), on the other hand, will be launching the Museum of Bicycling (MoB). It promotes the bio-psycho-social impacts of bicycling. Paulina Constancia has shared with us the great news that today, the 23rd, until the 3oth of December, her art, alongside the works of a few selected fiber artists, will be exhibited at the Textile Arts Factory in Thessaloniki, Greece. The exhibition is called MESSING WITH YARN. The artists are presenting various themes but the unifying part is the use of knitting, crocheting and lace. August 15 at the MoNA. The family of Japanese cellist Harumi Takaishi came to the MoNA to have a private tour of the museum with artist Paulina Constancia who happened to be in town. Harumi met Paulina’s nephew Mikko Pablo (also a cellist) at a peace concert for 1000 cellos in Hiroshima. Both Mikko and Harumi met as peace concert performers in Japan. Years later Hiromi’s family visits Mikko’s family in Cebu. Paulina’s art “Spider Finders” is a perfect backdrop for this loving Mother-son-daughter team. Here are Harumi, Kohtaroh and Miori mimicking the action in Paulina’s painting. Final pose with this musical and adventure-loving Japanese family. (L-R) Artist Paulina Constancia, Hidehiro (High School teacher and sax player), Kohtaroh (motorbike dealer and guitar player), Miori (fashion design student), Harumi (cellist). Here’s To Art, Music, PEACE & Friendship!!! It was a great meet and greet event at the MoNA last Saturday, July 30 in Cebu. Nice to see regular and new museum supporters. Followed of course by some simple yet delicious snacks prepared by West Gorordo Hotel’s Journey’s Cafe. Thank you to all of you who joined us on Saturday. If you want to see Paulina’s new collection “Tindahan sa Dalan/Roadside Markets”, please drop by Mon-Saturday, 10 am to 4 pm. For other inquiries please call West Gorordo Hotel at 2314347. Thank you so much to all of you who came to join us in celebrating our culture and heritage at the MoNA during Gabii sa Kabilin last May 27. We are glad that we joined forces with other heritage sites in Cebu to bring you a memorable heritage night adventure. Here are some photos of the Meet & Greet with international naïve artist Paulina Constancia during GSK 2016. May 18 is International Museum Day. On this special day last year, Paulina Constancia Museum of Naïve Art [MoNA] opened its doors to the public as well as held the 1st Kabilin Fest. As a proud member of the International Community of Museums, the MoNA endeavors to hold an annual KABILIN FEST (Kabilin is ‘heritage’ in Cebuano) on or around International Museum Day, May 18. With this festival, the MoNA, in partnership with various creative practitioners in the community, gives the Cebuano public the opportunity to experience a myriad of interactive cultural heritage workshops under one roof. As part of the M.O.M. presentation, Paulina will also be facilitating art therapy sessions and arts & crafts classes throughout the week to MoNA’s partner organizations serving Cebu’s marginalized women and children. Moments of Motherhood opens Saturday, May 17, 6 pm. 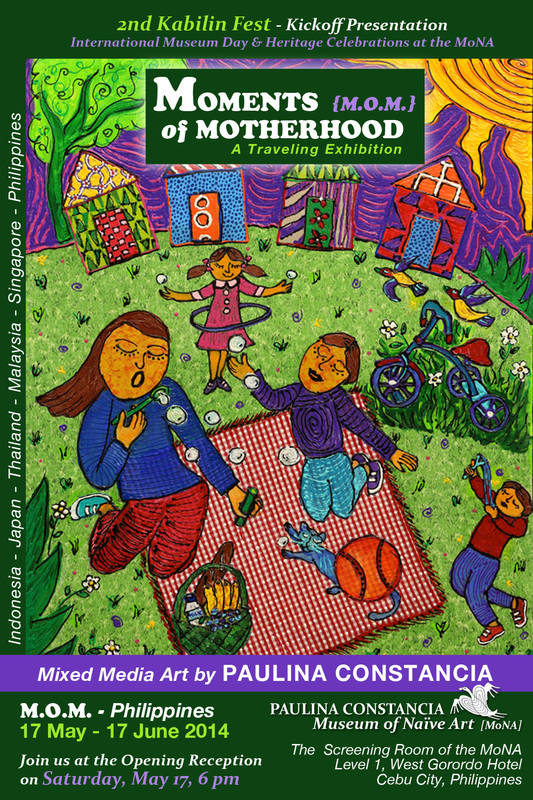 Exhibition runs May 17 to June 17 at the Screening Room of the MoNA, Level 1, West Gorordo Hotel, Cebu City. The Kabilin Fest is an International Museum Day and Heritage Celebration presented by MoNA & West Gorordo Hotel. Free Admission with Valid ID.